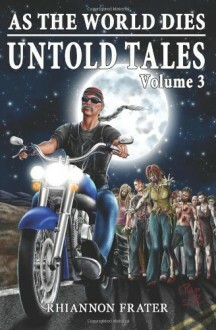 In the third volume of the AS THE WORLD DIES UNTOLD TALES experience three terrifying tales of those who are forced to face the unrelenting and hungry walking dead. Returning to Texas after celebrating his divorce in Vegas, Rune, a biker cursed with the ability to see ghosts, discovers that the world is being taken over by the hungry undead. Soon he realizes he will have to depend on all his abilities to survive not only the ravenous zombies, but the dangerous men lurking on the back roads of Texas. Senator Paige Brightman abandoned the Madison Mall and its inhabitants to the hungry hordes, but her journey did not end there. Her attempt to reach the president’s safe haven called Central has far reaching ramifications for her and the people she abandoned. The final in the three stories reveals the aftermath of the great battle in SIEGE as one woman faces the ultimate decision whether to live or die in a world of the undead.